Celebrate grizzly bears at Bear Day! Mark Saturday, April 13th on your calendars! To coincide with bears’ emergence from their winter dens, WildSmart is hosting Bear Day at Canmore Nordic Centre Provincial Park's Day Lodge. This event is a celebration and welcoming of grizzly bears back on the landscape for another year. It’s also a great opportunity for the public to learn more about our area's grizzly bears and serves as a reminder that it’s time once again to be bear aware. Indoor and outdoor activities include bear spray demonstrations, bear safety talks, a bear trapping demonstration, and a scavenger hunt for the kids! Learn how to camp safely in bear country, and view grizzly bear and other wildlife displays. Back by popular demand, we will have hikes for families to learn the ins and outs of being “bear aware” on the trail in a fun and interactive way (registration required). This is a FREE family-friendly event! Activities begin at 9:00 am and end at 3:00 pm. In the event of inclement weather, the majority of activities will take place indoors. Do you know how to behave when you’re in bear country? Join a Human-Wildlife Conflict specialist for a 45-minute talk on how to reduce your risk of encounters with bears and what to do should an encounter occur when recreating in bear country. In response to high demand, bear spray demonstrations with inert bear spray are being offered throughout the day. Come try it out for yourself! Join WildSmart for this fun and educational walk through bear country! You’ll learn how to use bear spray and how to prepare for a hike in bear habitat. On the trail you’ll practice how to avoid bears and how to handle a variety of different bear encounters with help from the WildSmart bear. This hike is designed for families and children must be accompanied by an adult. Join us as we welcome bears back from their long winter sleep. How does a bear culvert trap work? Why do adult female grizzly bears get trapped in the Kananaskis Valley? Join us at 12:30 pm to trap a grizzly bear “volunteer” in this ½ hour demonstration. 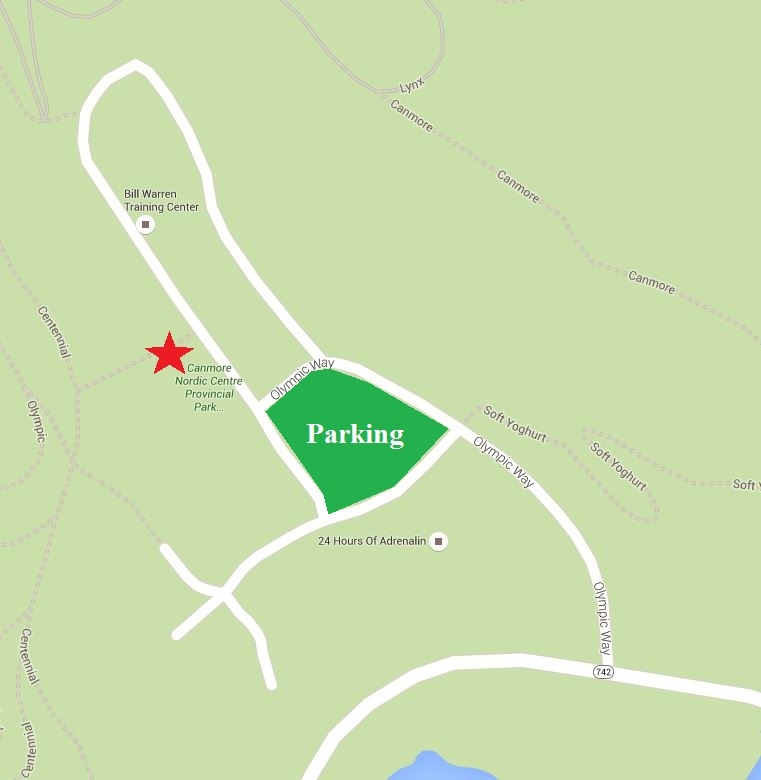 Canmore Nordic Centre Provincial Park is located at 1988 Olympic Way immediately west outside of the Town of Canmore, Alberta. Hop on ROAM Transit, Route 5 (Saturdays) - see the schedule here! Hungry? The Cornerstone Café (located in the Day Lodge) serves hot and cold meals, beverages, and energy snacks!